Well it's been a while since I last updated the blog but I've not been idle. I've been furiously painting my way through all sorts of oddments and seem to be keeping the hobby mojo going well for January! As previously mentioned, I'd planned on making hair curler armies in true old school style but the times have moved on ant the style of curler is surprisingly difficult to obtain. I'd then thought of just biting the bullet and placing an order with Irregular to get all the bits I needed but I stumbled across an article suggesting Granny Grid (the plastic webbing used for cross stitch) and as I had a few bits of the stuff lying around, and being cheap, I thought I'd give it a bash. I must admit that my initial reaction wasn't too favourable but once the unit is based and tiny flag added, they seem to all of a sudden work. At 2mm scale, Infantry units are always going to be a bit of a challenge to represent but the impression of ranked troops looks fine from a range of 2 foot which is fine with me! I need to put together a second brigade to make a regiment and give my Orcs some ground troops to take objectives and generally get stomped or blown up so I can see more tiny troops making an appearance soon! As already mentioned, I'm finding these chunky figures almost paint themselves and the Vampyre is no exception and he was a real pleasure to work on. Next up, the first of my Zombies. He's great fun and surprisingly expressive for a dead fellow. Again the sculpting is rough and stylised in places (such as his massive hands) but it doesn't matter. In fact it gives the whole thing a charm that more polished sculpts, especially computer based ones, lack. The rather more worn figures for the warband are local militia who have decayed to the point of being skeletal. Again these chaps are great fun to paint and have just enough detail to keep them interesting without being fussy. 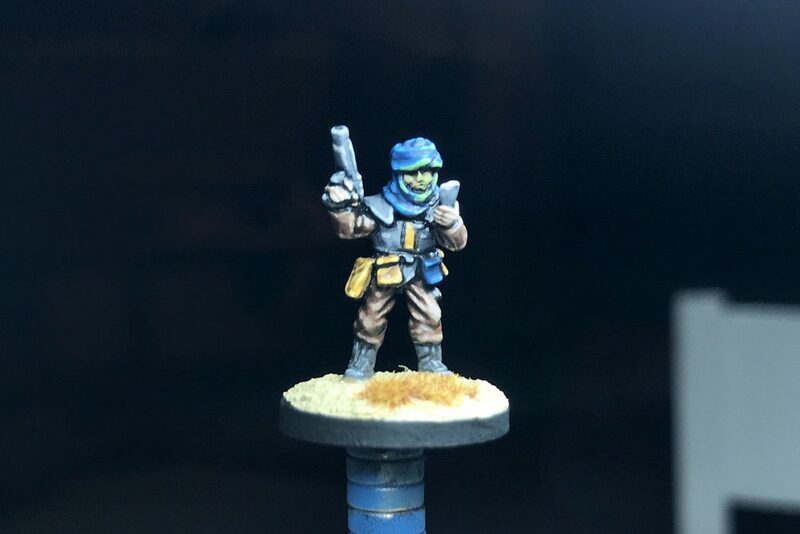 The last militia is possibly a little boring colour wise, but his pose os great and his grinning skull peeping out from his ragged hood looks fab too! This leaves me with four more Zombies to paint up, a couple of which need a little tlc as their bayonets have broken off and then I'll be moving onto the Ferach Elves. I do recommend folks take a second look at the Flintloque range as it's surprisingly satisfying to work with. The cartoony proportions add to their charm and I'm really looking forward to finishing off the force! With all this painting, I'm falling behind in the gaming department with just one game played and now three weeks into the year. On the one hand I really want to get some games played but on the other, my painting mojo is strong so I'm not sure I'll be able to resist painting more gubbins and then seeing about a game or two further down the line. I also plan on getting to grips with my assorted 6mm and 15mm projects with an aim to get some more painting, sculpting and converting done in the near future so watch this space. In the meantime, All the best! Those Orks are so very very tiny!! These very te ork troopers look great put together on that base. Clever these flags, you could easily do some elite troopers the same way as the regular ones but just add a different flag. Cool these Flintloque undead, though your vampire appears to have a bit of a tan ;). Very cool - I love this 2mm project. I bought a 3D printer recently and I've been tinkering with 1:1500 land sci-fi (so basically 1mm) and I'm struggling with an infantry solution, especially as they aren't 'ranked'. I love tiny scales! Up-cycling Plastic Water Bottles - Had some empty plastic bottles and blister packs sitting around, so turning them into something new.